Dividend Aristocrats, companies with 25+ years of uninterrupted dividend growth, generally outperform the broader market. They also offer slightly higher yields and amazing dividend growth track records and prospects. 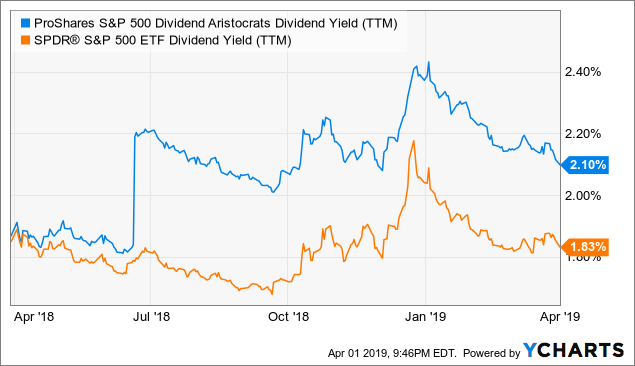 This article gives a quick rundown on the Dividend Aristocrats, their investment thesis, and their performance for the year so far. As economic conditions worsen, recessionary risks increase and volatility skyrockets, many investors are looking for safe, recession-proof alternatives. 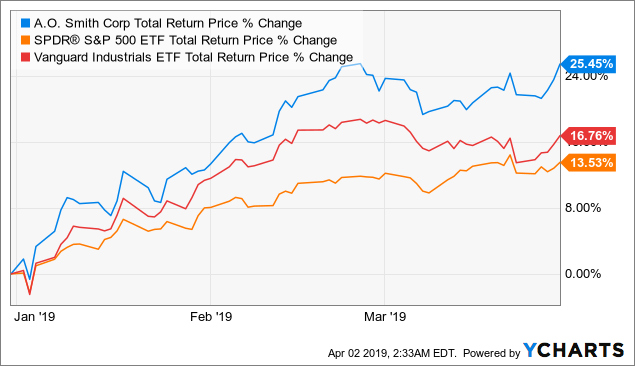 The ProShares S&P 500 Dividend Aristocrats ETF (NOBL), both the fund itself and the underlying stocks, are some of the safest, highest-quality, recession-proof stocks out there, so they are perfect for investors looking for more defensive options. 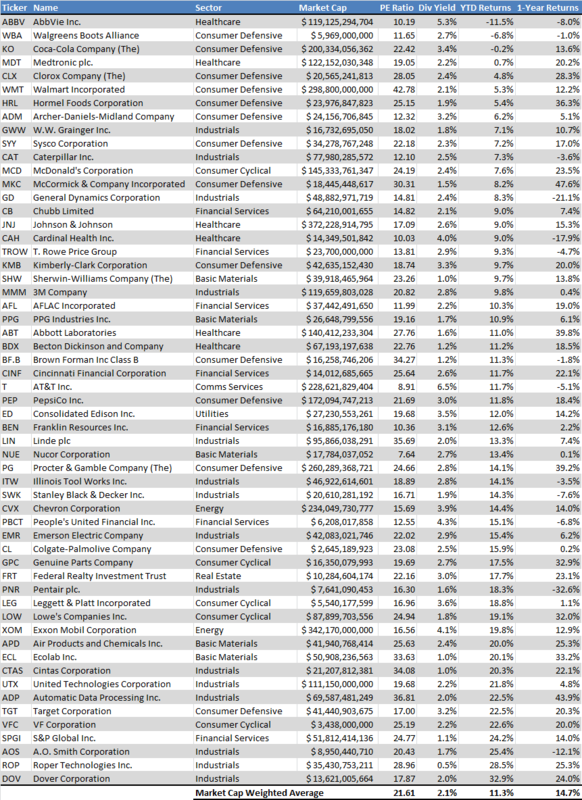 I've included a table showing their performance for the year so far, and identified three Dividend Aristocrats with negative returns to date which present an interest buying opportunity for investors. 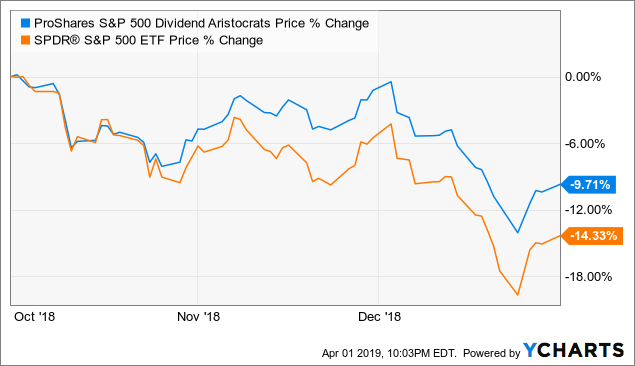 The Dividend Aristocrats are all S&P 500 constituents that have increased their dividends for twenty-five consecutive years or more. Low-risk, recession-proof stocks and funds are always excellent investment choices, and they are looking particularly strong as of late. Economic growth is slowing down in the U.S. and across the globe, and many analysts are expecting very sluggish growth this year. The yield curve inverted this past week, which is one of the strongest predictors of a future recession, so economic conditions could materially worsen in the coming months. Investors should consider defensive investment options in their portfolios, and the Dividend Aristocrats are an excellent choice in this regard. Total shareholder returns have been even better, with the Dividend Aristocrats outperforming the S&P 500 by about 2.3% since inception. As mentioned previously, these stocks generally perform better during recessions, which explains their outstanding long-term performance. Dividend Aristocrats are low-risk, high(er)-yield investments with market-beating total shareholder returns, especially during bear markets. I believe they are excellent investment choices and particularly appropriate for the current volatile and uncertain economic environment. Investors looking to buy the Dividend Aristocrats can either invest in NOBL or create their own portfolios with some or all of the Aristocrats. For those wishing to do the latter, I think a strategy of opportunistically buying these stocks on moments of temporary weakness is ideal, as cheaper prices mean higher yields and should result in greater shareholder returns. These three companies have underperformed for different reasons. Readers are probably familiar with the pharmaceutical company AbbVie (ABBV) and some of its recent issues. ABBV is losing patent protection for Humira, its blockbuster arthritis medication that is responsible for 60% of the company's revenues, in the coming years. The Trump Administration is also making a big push to lower drug prices, which would hurt ABBV as well as most pharmaceutical companies. Regulatory risks and loss of exclusivity are a constant in this industry, so perhaps the market has overreacted. Walgreens Boots Alliance (WBA), a pharmacy/drugstore company, is down due to general industry malaise. The company's peers have reported disappointing earnings, and the market seems to believe WBA will follow suit. It would probably be a good idea to check back on the company after it actually posts earnings. Coca-Cola (KO) is down due to disappointing guidance - it expects no earnings growth in 2019. Results are somewhat understandable, but long-term investors might be willing to overlook the company's short-term weakness. I'm also including a table with data from all the Dividend Aristocrats ordered by YTD returns. For comparison purposes, the S&P 500 crashed 9% in December and is up 14% since. Dividend Aristocrats are outstanding investment choices due to their low risk, higher yields and market-beating total shareholder returns. 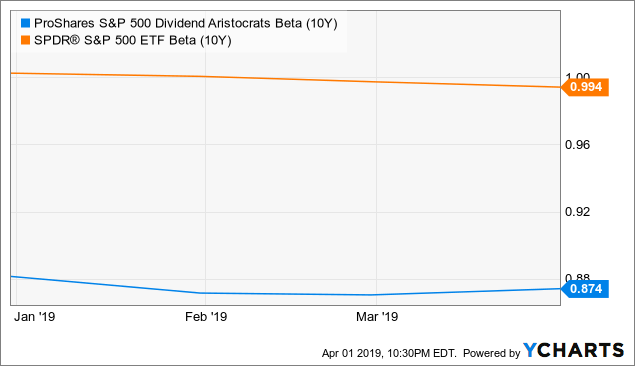 Investors can either invest in the Dividend Aristocrats as a whole through NOBL or opportunistically add specific Aristocrats to their personal portfolios. For those doing the latter, I think taking a look through these lists might be useful.